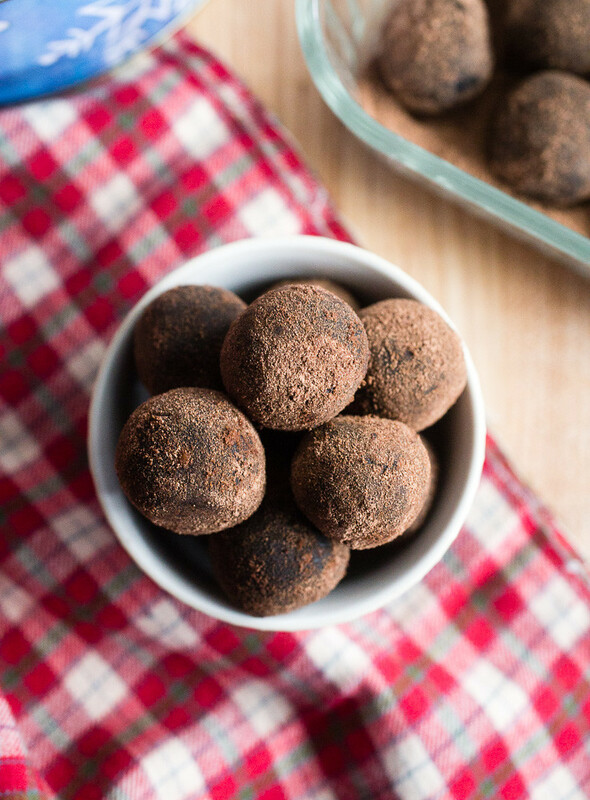 These no-bake booze balls make adulting during the holidays so worth it. Chocolate, pecans, and rum, bourbon, Irish cream, whiskey, or Kahlua…win win win! The Christmases of my childhood were spent over the river and through the woods at my grandma’s house playing endless rounds of war, kings in the corners, rummy, poker (yes), and tripoley with my brother and cousins. As you could imagine, there was also a fair amount of poking through cookie tins stacked high in the kitchen to see what we could use to gamble with. Don’t ask. And as much as I loved my grandma, I hated the cookies she made: 90% of her Christmas stash had nuts in them. For a kid who got tricked into eating nuts as a toddler and subsequently swore them off for life, this was torture. My brother on the other hand, with his oppositionally defiant behaviors, sought out any treat that had booze it, even as early as the age of 8. These booze balls were his jam. 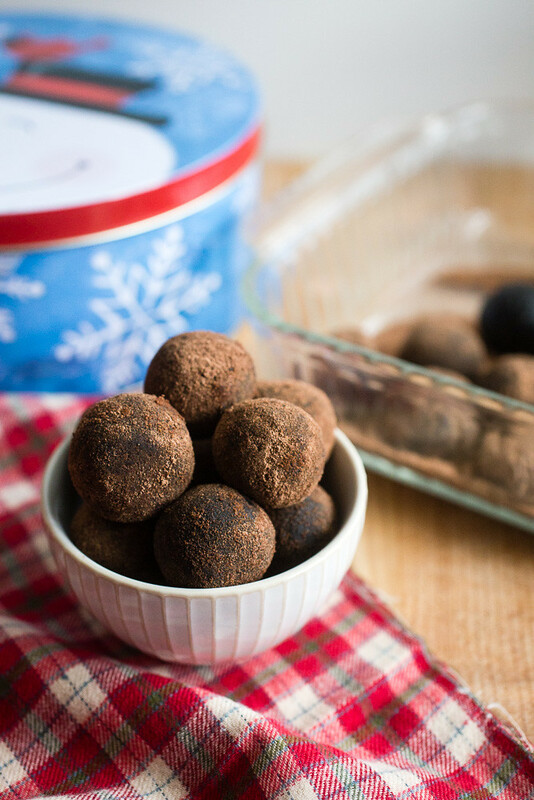 Back then, we called them rum balls. Today, I call them booze balls since I made them last weekend with both rum and bourbon (a half batch for each spirit). They’re a no-bake cookie of ground chocolate wafers, pecans or walnuts, confectioners’ sugar, corn syrup, and booze, and then rolled in Nestle Quick (keep reading). I leave the choice of booze up to you; Irish cream or whiskey or Kahlua might work well too. You want to choose a booze with some depth and warmth to it. And because I couldn’t leave you hanging at the sound of Quick, I also rolled a few in sweetened cocoa. 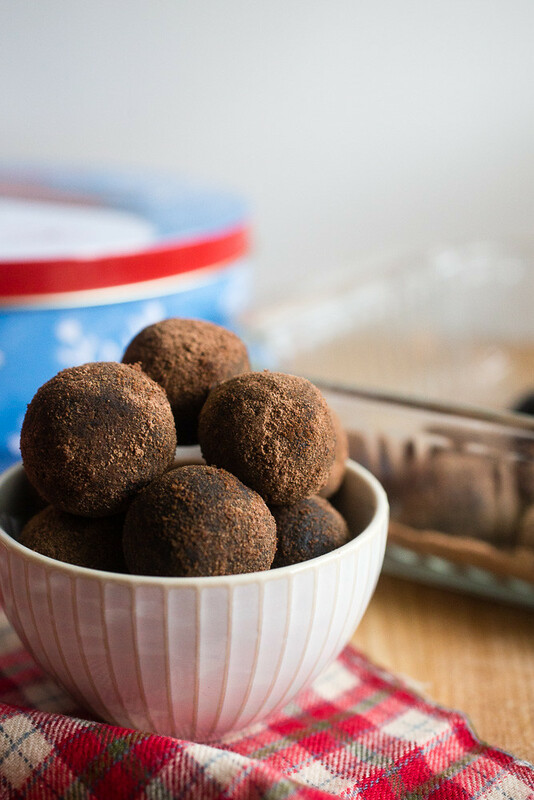 I’ve never actually eaten these booze balls, even as an adult, but I made them this year for my brother for when he arrives this weekend for Christmas. We could all use some comfort this year as we muddle through our first holiday season since dad’s passing, and I know he still adores these treats. I did sample a couple of them since pecans are no longer my enemy and I have to say, I really like them – both the rum and bourbon versions. I didn’t taste much of a difference between those rolls in Quick vs. cocoa but the booze is a prominent flavor and the bourbon version packs more of a sneaky punch than the rum version does. Either way, if you’re looking for a different sort of holiday treat to make – and a super easy one at that – look no further. Make them now since they’ll need a couple of days for the flavors to really meld before serving. In the bowl of a food processor fitted with the blade, process the cookies until they are uniformly fine crumbs. Transfer to a large bowl. Add the nuts to the bowl and process in the same manner, taking care not to process too long or you’ll end up with nut butter. Transfer to the bowl. Sift the sugar into the bowl. Add the corn syrup and booze. Stir everything together with a rubber spatula until a dark chocolate dough emerges. This will take a bit of mixing but be patient. Add the Quick or cocoa powder to a shallow dish. Roll the dough into 1-inch balls and drop them into the dish. The dough may seem a little dry (and you should keep the unrolled dough covered with plastic wrap or a damp paper towel while you work) but keep working it in your hands until it comes together. After you’ve rolled a bunch, swirl them around to coat fully in the Quick/cocoa powder. Keep the balls in a tightly sealed container at room temperature for up to 2 weeks. The balls will deepen in color over time as they absorb the coating. I lined a cookie tin with wax paper and piled them up in layers, allowing the wax paper corners to hang out the top of the tin which helps to seal it, as my grandma and mom always did.